Picasso may or may not have indirectly killed John William Godward. But let’s start from the beginning. John William Godward was born on August 9, 1861 in Wimbledon to two people who really didn’t want an artist for a son. But as it happens, they were given an artist for a son. They tried everything that they could to get him to not be an artist, which resulted in Godward not being able to really communicate when he grew up. He eventually had four younger siblings that his parents could control, so he got to work on his art. After finishing school, his father made him work for his insurance company. And when that went super poorly, he was allowed to work for an architect, whose son, William Clarke Wonter – also an artist – became one of his best friends. Art friends! As Godward became more and more talented at painting, his family got more and more pissed about it. Godward was showing at the Royal Academy and the Royal Society of British Artists on Suffolk Street. He began participating in the Birmingham Royal Society of Artists’ Autumn Exhibitions and in 1889 he made his first appearance at the Paris Salon. Eventually, he made enough money to move out of his parents house into a place in Chelsea. All of this added up to his parents hating him, but the straw that broke the camel’s back was when he moved to Italy with one of his models. He was permanently disowned and his family removed him from the family photo albums and burned his letters. But Godward was living it up in Rome, doing as the Romans do. He became known as the pretty-girl-in-a-tunic painter in what was known as the “Marble School.” With the exception of his family rejecting him, all was well…for the time being. When the art world took a turn for the modern, Godward, as a Neo-Classicist, couldn’t keep up. He saw that we was becoming more and more obsolete and modern art was sweeping the world. He became less prolific and super depressed until eventually Godward went god-ward and died by suicide via gas poisoning at the age of 61. Before doing so he told his model, Marietta Avico, that “Sixty years was enough for any man to live” and in his suicide note, he wrote that the world wasn’t big enough for both him and Picasso. "John William Godward." American Art News 21, no. 14 (1923): 6. http://www.jstor.org.libproxy.newschool.edu/stable/25590052. Like the veils J.W. Godward painted, the biographical information about his life is very thin. Born in the Victorian era, his parents hated that he chose the life of a painter and shunned him (they were investment bankers that were all about the art of the deal). This was more than your typical family snub, however. Going beyond cutting contact, they cut him out of family photographs. When he died by suicide at the age of 61, they burned all of his writings and remaining photographs because they were so disgraced by him. 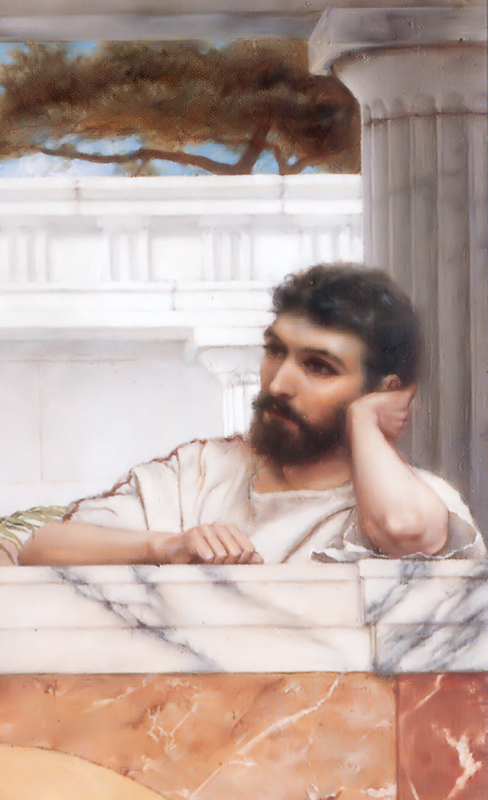 So it is difficult to get a historical snapshot of Godward as an artist, and much about him is mere assumption, even the single remaining portrait of him. Allegedly, he killed himself due to the rising popularity of cubism, writing in his suicide note that the world was not big enough to accommodate both him and a Picasso. There was never a response from Picasso himself, not caring an inch. Perhaps he never heard. What we do know, however, is that Godward was one of the most successful Neoclassical painters of his time. He studied under Sir Lawrence Alma-Tadema, a follower of Frederic Leighton the First’s founding theories on Neoclassical painting. Alma-Tadema’s work was known for ruddy, rosy women posing on or near marble architecture, something that Godward took up in stride in his own work. Together, they were known as part of the Marble School due to how often the shiny material featured in their work. In fact, everything looked like marble on the canvas, even the flowers. The critical assessment of Godward’s work in his own time, while positive, often thought of him simply as the disciple of Alma-Tadema. Godward would do extensive research for each his paintings so as to make the scene as convincing as possible. While this may seem like him going over the top by today’s standards, the audience of his time would have been highly educated in the history and culture of the Greco-Roman world. However, he was often called out for putting Victorians in ancient dress that was merely suggestive of antiquity and not authentic. Furthermore, he is significant for demythologizing ancient world subjects, and some critics say that he, along with Alma-Tadema, lead to the demise of Neoclassical painting because of this. Poor Godward, ruining what he loved the most. He never got a break. Today, he is admired for his contributions to a genre that was of its time, and thus providing context for the world before it shifted towards modernism. He is specifically known for his painterly Pompeian style. Considering this, it is fitting that his life went to literal ashes after he died. His surviving paintings leave behind a fascinating trace, much like the ashes of Pompeii. Swanson, Vern G. 1861-1922: The Eclipse of Classicism. ACC ART BOOKS, 1997. But let’s start from the beginning. John William Godward was born on August 9, 1861 in Wimbledon to two people who really didn’t want an artist for a son. But as it happens, they were given an artist for a son. They tried everything that they could to get him to not be an artist, which resulted in Godward not being able to really communicate when he grew up. He eventually had four younger siblings that his parents could control so he got to work on his art. After finishing school, his father made him work for his insurance company. And when that went super poorly, he was allowed to work for an architect, whose son, William Clarke Wonter – also an artist – became one of his best friends. Art friends! As Godward became more and more talented at painting, his family got more and more pissed about it. Godward was showing at the Royal Academy and the Royal Society of British Artists on Suffolk Street. He began participating in the Birmingham Royal Society of Artists’ Autumn Exhibitions and in 1889 made his first appearance at the Paris Salon. Eventually he made enough money to move out of his parents house into a place in Chelsea. All of this added up to his parents hating him, but the straw that broke the camel’s back was when he moved to Italy with one of his models. He was permanently disowned and his family removed him from the family photo albums and burned his letters. But Godward was living it up in Rome, doing as the Romans do. He became known as the pretty-girl-in-a-tunic painter in what was known as the “Marble School.” With the exception of his family rejecting him, all was well…for the time being. Eventually the art world took a turn for the modern and Godward, as a Neo-Classicist, couldn’t keep up. He saw that we was becoming more and more obsolete and modern art was sweeping the world. He became less proficient and super depressed until eventually Godward went God-ward by committing suicide by gas poisoning at the age of sixty-one. Before doing so he told his model, Marietta Avico, that “sixty years was enough for any man to live” and in his suicide note, he wrote that the world wasn’t big enough for both him and Picasso, which is how Picasso killed John William Godward. John William Godward (9 August 1861 – 13 December 1922) was an English painter from the end of the Neo-Classicist era. He was a protégé of Sir Lawrence Alma-Tadema, but his style of painting fell out of favour with the rise of modern art. He committed suicide at the age of 61, and is said to have written in his suicide note that "the world is not big enough for [both] myself and a Picasso". His already-estranged family, who had mostly disapproved of his becoming an artist, were ashamed of his suicide and burned his papers. Only one photograph of Godward is known to survive. Check out the full Wikipedia article about John William Godward.